Read on here for the easiest and quickest method to take off waterproof eyeliner, liquid liner, and long wear eye shadows and even the most stubborn eye makeup that one can dare to wear! You will be surprised how quickly it takes off waterproof eye makeup and by how easily it works (no rubbing or tugging at delicate under-eye skin)—and that it works equally well for waterproof mascara, too. 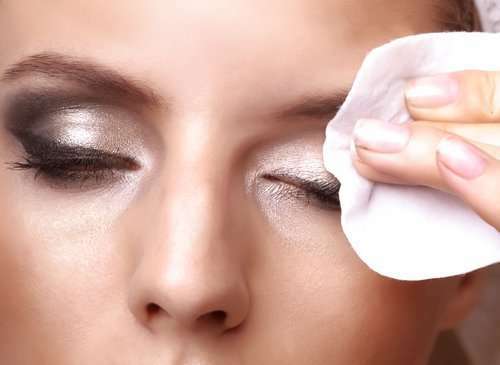 You can use organic coconut oil to remove even the most stubborn eye makeup. Here’s why: To quote cosmetic chemist Joseph Cincotta: “Coconut oil solubilizes or breaks up water-resistant substances used in eye shadow and mascara, releasing them from the skin and lashes. And unlike a lot of traditional eye-makeup removers, it’ll even leave your skin softer and younger-looking – It’s great for your skin, because it moisturizes and smooths as well”. (ii) Anti-bacterial facial cloth – they really absorb the makeup and prevent it from spreading all over the face. 1. Put two fingers in the coconut oil and scoop out a nickel-sized amount of the coconut oil. Since coconut oil is solid at room temperature, so rub it between your fingers to warm it up first. Rub those two fingers with the identical two fingers on your other hand. 2. Look in the mirror to make a mental photograph then close your eyes and gently rub each eye with the corresponding fingers. You can certainly do one eye at a time. 3. Continue gently rubbing the oil over the makeup on both the top and bottom eye lids. You’ll feel the makeup melt away under your fingers. Or alternatively, smooth the coconut oil over your skin with your fingers, and then wipe it off with a dry cotton ball and it’ll take your makeup with it. 4. Take a good quality facial cloth and wipe everything off on the bottom lid. Repeat on the top lid too. And if you’ve filled in your brow, one sweep will take that off as well! (i) For those who have sensitive eye-skin, they can sanitize their fingers with anti-bacterial soap at the start. (ii) Make sure to prevent oil getting in your eyes, since it will temporarily blur your vision. Caution: Coconut oil is a codmogenic, so it can clog pores. But this is not true for everyone. However, use coconut oil on your face and neck with caution.